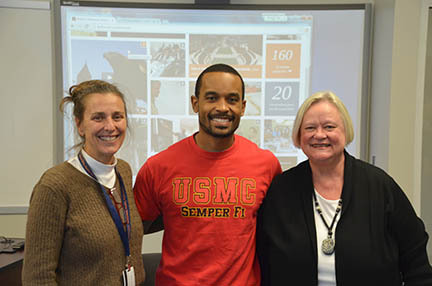 Kinesiology School Director Dr. Mary Rudisill, Khalil Lee, and College of Education Dean Betty Lou Whitford welcome the students to Auburn. Lee recently defended his dissertation and will receive his Ph.D in Exercise Physiology in December. Students from the Historically Black Colleges and Universities (HBCUs) of Morehouse College in Atlanta, Georgia, and Tuskegee University in nearby Tuskegee, Alabama, visited the School of Kinesiology on November 13 to learn about graduate school opportunities. This annual event provides students at HBCUs an occasion to visit Auburn’s campus and meet faculty and staff to consider continuing their studies at the graduate level. The graduate programs in the School of Kinesiology include Exercise Science, Physical Activity and Health, and Physical Education. Dr. Jared Russell, Associate Professor in the School of Kinesiology, created the program to improve diversity recruitment and retention for Auburn University’s graduate programs. Dr. Russell obtained his B.A. in Health & Physical Education from Morehouse College in 1997. He is also the Chief Diversity Officer within the College of Education. Dr. Gary Hill, Associate Dean of the new Edward Via College of Osteopathic Medicine, spoke during lunch and inspired the students to do what they love. He conveyed that if he could become a doctor, so could they. Dr. Mary Rudisill, Director of the School of Kinesiology, encouraged students to become part of the Auburn Family. “You come here to build your resume,” she said, and stressed the importance of choosing a place for graduate school. A number of Kinesiology graduate students were students at HBCUs. Ph.D candidate Chris Wilburn is a 2013 Morehouse College graduate and is specializing in Biomechanics research. Another Morehouse College graduate, Desmond Delk, is with The Truman Pierce Institute, a research and outreach unit in Auburn University’s College of Education devoted to the study and improvement of teaching, learning, and leadership. Khalil Lee, who will receive his Ph.D in December, was also on hand to talk with the visitors. Dr. Russell also coordinates The Future Scholars Summer Research Bridge Program, a summer academic and research experience for prospective graduate students. It aids in the recruitment and transition of undergraduates from traditionally underrepresented groups into Auburn’s School of Kinesiology graduate programs. Participants are provided with faculty mentorship, graduate-level academic preparation, and meaningful research, teaching, and outreach opportunities.